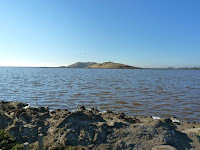 This packed-earth/mud, long loop trail (shown as a solid red line on Bay Trail map) extended out into the San Francisco Bay, initially running west, alongside the approach road (Marshlands Road) to Highway 84 - Dumbarton Bridge. It eventually curved around back (east) toward the shore. 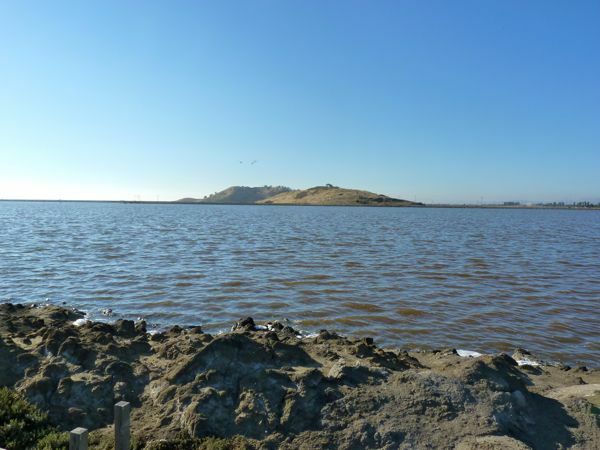 I did not see any other walkers further out into the Bay -- so this 5+ mile loop might be a good, peaceful place to get away from it all, and if you don't mind the lack of green plants or shade trees. 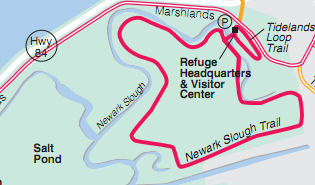 (The green area on the map is deceiving; this area is mostly open water and some marsh at high tide.) As with other bayside trails, this walk can be a little tiring/less fun on a windy day. But, during my walk there was only a breeze blowing -- enough to send a few tiny clouds of sea foam onto the trail, where they quickly melted. This trail offers interesting views of the Dumbarton Bridge; and because of this trail's proximity to the water, it was a good place to spot a variety of birds. 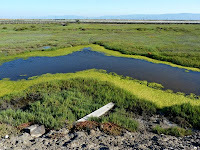 Before returning to my car, I also walked the smaller loop trail -- the Tidelands Loop Trail. 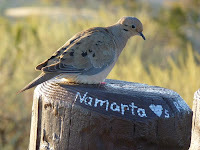 And, I happened upon a dove who was sitting on a fencepost that had been marked up with little love notes. 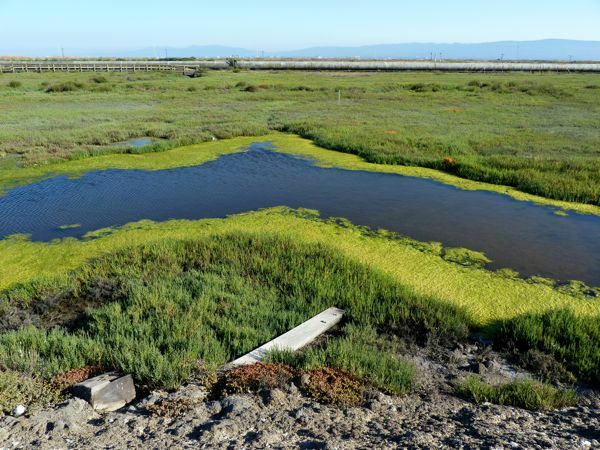 3 terns; 3 ground squirrels; 5 little brown jobs (LBJs); 73 swallows; 4 snowy egrets + 2 great egrets; 4 medium sized unidentified brownish shorebirds (UBBs) + 21 tiny UBBs; 7 willets; 88 sea gulls; 1 cormorant; 2 unidentified flying bugs; 2 dragonflies; 1 hawk/falcon; 1 large, long cloud of ankle high small flies; 1 duck; 4 black-necked stilts.